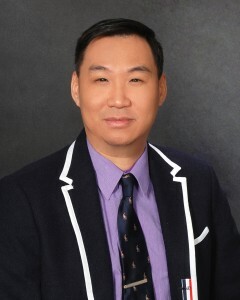 Albert Siu, Esq., is a second generation ABC (American Born Chinese) and speaks conversational Cantonese and Mandarin. His ancestral home is Xiaoshan, Zhejiang Province, People’s Republic of China. His family immigrated from Hong Kong in the early 1970’s and has lived in Southern California for over 40 years. He has been trusted to represent clients in all areas of the real estate market, including developers, property managers, real estate companies, residential and commercial landlords, restaurant owners, hotel partnerships, joint ventures, and foreign investors from Asia. He travels frequently to Hong Kong, Taiwan, and the People’s Republic of China to assist foreign nationals and corporations in legal matters in the United States and has worked with Chinese law firms to resolve cases in favor of his clients. He represents business clients of all types, including corporations, non-profit charities, partnerships, limited partnerships, and limited liability companies in California. He also handles estate planning matters and EB-5, F-1, L-1, and H-1B immigration cases. 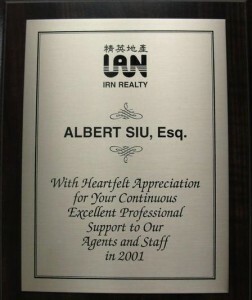 Albert Siu is an active California licensed real estate broker since 1993 and a California licensed attorney since 2001. While still attending high school at the age of 17, he passed the California Department of Real Estate Salesperson exam but was not issued his real estate license until his 18th birthday. As a result, his primary legal expertise is in real estate related matters. He dedicates 50% of his practice to litigation and 50% to transactional cases. His attention to detail, legal strategies involving retrograde analysis, and the ability to think “outside the box” has proven successful in navigating legal intricacies facing his clients. He has extensive experience representing select groups of sophisticated and accredited high net worth investors (HNWIs) from the People’s Republic of China, and is known for being cool, calm, and collective. 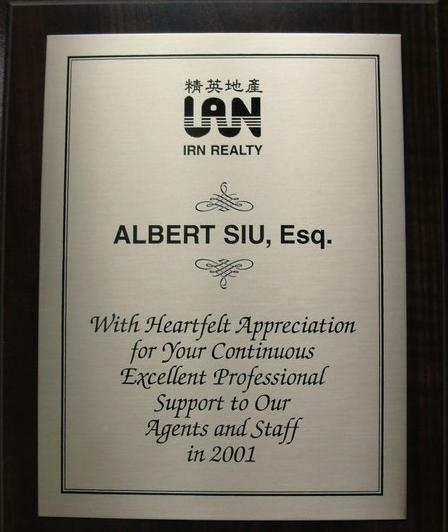 Albert Siu is the In-House Counsel for IRN Realty since 2001, one of the top 12th largest real estate firms in California with over 1,200 agents in three offices. He is a frequent guest speaker for the West San Gabriel Valley Association of Realtors since 2006 and provides free seminars to real estate agents and brokers on legal updates, CAR contracts, short sales, foreclosures, and risk management. He has been interviewed by numerous Asian newspapers, the Los Angeles Daily Journal, and Los Angeles Times on current affairs in the real estate market.